Don't worry I've not taken up another hobby! Pigeons are not normally an animal I'd say I like, in fact I'm normally trying to keep them away from what I'm doing. 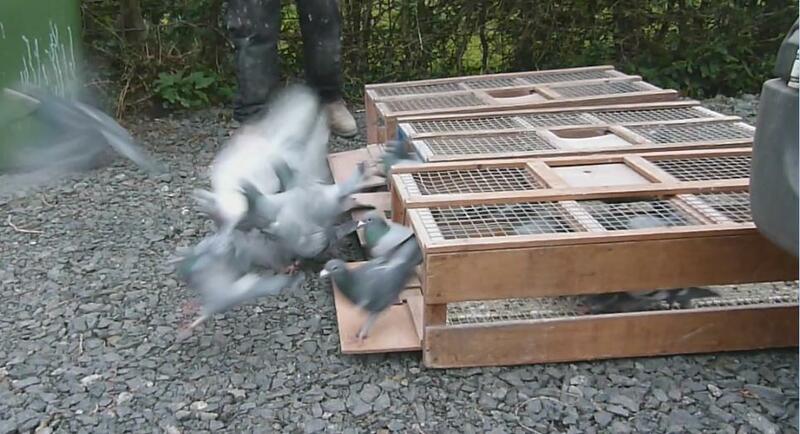 But A friend at work is mad into pigeon racing. He eats, sleeps and breathes it. His partner says that if he thinks any more about it he'd grow feathers. I guess this is how I've got roped into helping him train them. As I live furthest from him, and on the same line in which his club race from, I'm taking his pigeons home once or twice a week letting them go. It's amazing really, it's about an hours drive between us and the pigeons will do the distance in around half an hour (depending on the wind). Scientist still aren't a 100% sure how these pigeons find there way back. I can see how it would be an interesting hobby, all the different ways of training them and breeding them, knowing that seconds count in a race, pigeons racing at 60mph. Sadly this old pastime is dying out, there's too much against the modern pigeon keeper now and in twenty years I'll be surprised if there's any left doing it, just more people playing computer games. I have two pet pigeons and a dove. Pigeons are the most amazing birds, supremely intelligent,in fact they perform better at memory tests than humans. I love pigeons! I love them when they're not on my garen or on my fathers crops! Still a popular hobby in West Cumbria, all ages seem to be involved, I can't see it dying out here in the foreseeable future. Down this way it's not as popular as it was and seems very few younger people starting it. The racer who I know says things like increased use of mobile phones, larger numbers of birds of prey all have a knock on to how they race and how many get back. I think they still fill all the hotels and B&B's when it's 'Pigeon week' in Blackpool Kev. It's still popular now but from what I hear not so many are taking up the sport. My mate is 30 and he's the youngest in his club. Still I hope it continues, doesn't do anyone any harm!